When I saw these beauties on Toute Sweet's facebook page, I desperately wanted to make some of my own! I wanted to change it up a bit and put my own spin on them though by adding in orange with the yellow.However, when I did so, I ended up with a giant mess and very stange looking orange cookies. What to do? 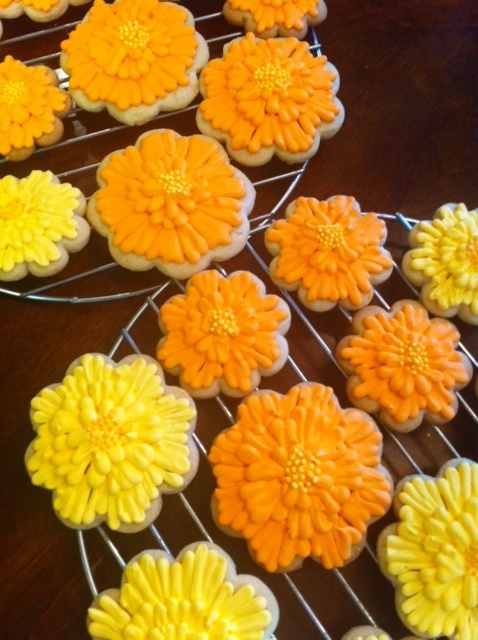 Well, after trolling 'The Sweet Adventures of Sugarbelle' I noticed her stunning marigold cookies. So quickly, I turned my little suns into flowers! Mine are not exact copies, but I think they still turned out beautiful. They made their appearance at my girls end of the school year pool party.